Data analysis, visualization and collaboration for individuals and teams. Internet of Things, Business Data, Files, Databases, Web and APIs all available in a unified stream oriented data model. Dashboards update as soon as new data is available. No refresh periods, always up to date. 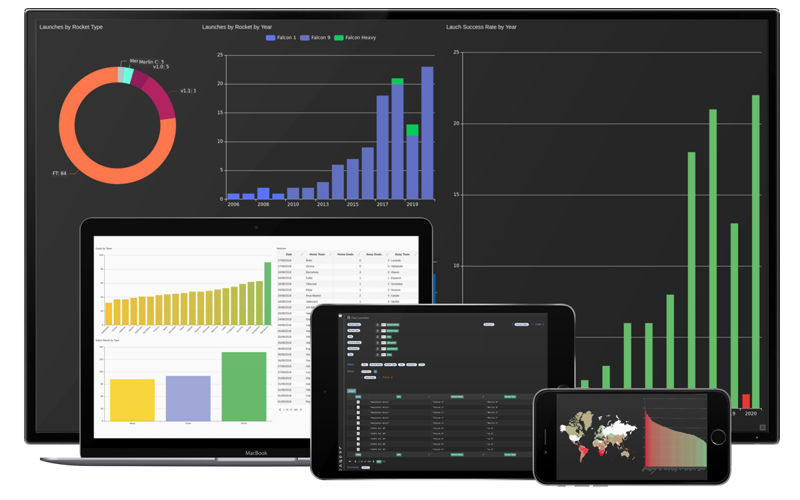 Dashboards adapt layout and content to the current device resolution. Nothing to install, just a modern web browser. No programming knowledge required, manipulate the data until it fits your needs, instadeq records the operations and creates data manipulation scripts that are applied to all updates. Capture information easily by building and sharing Instadeq Forms. If you have a special requirement you can always use or simple API. Define how the incoming data should be aggregated by just dragging and dropping fields, see the aggregations update as data changes. Instadeq suggests visualizations according to the current aggregation, explore the alternatives, select the best one and customize it to your needs. Each visualization gets a default configuration based on the available aggregations but provides flexible settings that reflect changes instantly. Visualize incoming data as it happens, see it flow or pause to inspect an entry in detail. Rename and transform fields, edit values, add or remove items from records or lists, calculate values with formulas, all with intuitive and powerful programming by demonstration. Your actions are recorded and applied to all updates, manipulate data without writing a single line of code. Review and edit data operations, add conditions, apply changes to all the items in a list, edit or remove changes to get the data the way you need. Add notes anywhere to clarify the logic behind each action. Share with one or more users, with all authenticated users, protect it with a password or make it public for the world to see! Adapt a dashboard layout to the target device to provide the best experience for every screen resolution. Shared dashboards provide comments, search, advanced filtering and the possibility to react to events on one chart and filter others or open a new dashboard. Download the raw data from a chart as a CSV file to inspect if further in a spreadsheet or as input to a program. Subscribe to our email updates. Only sent when we have something important to share, promise.